Let our courteous and professional drivers transport you in a San Jose Charter Bus safely and comfortably. 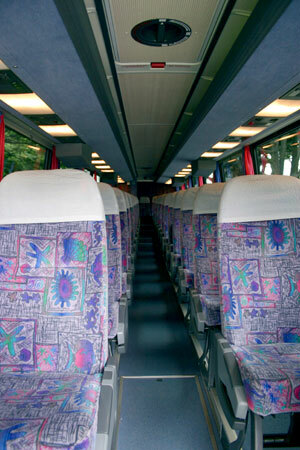 We can provide a variety of deluxe San Jose charter busses for your San Jose bus rental needs. The most modern San Jose bus rentals, with the greatest availability are the full-size San Jose motor coaches with seating for 40-47 passengers (40' coach), and the 50-56 passenger motor coaches in San Jose (45' coach). 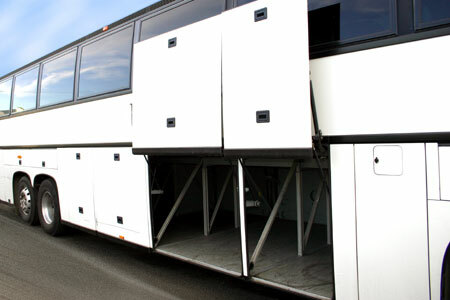 These bus rentals in San Jose have spacious carry-on luggage space, tinted safety glass windows, reading lights, spacious reclining plush seating, climate control, clean restroom, large luggage compartments, video monitors (LCD on our newer buses), DVD and/or VCR and PA system, as well as air ride suspension for ultimate riding comfort. Radio and/or wireless communication is maintained between dispatch and between San Jose coaches. We can provide your group with transportation services for your corporate event, wedding, tour or other social event. We provide San Jose Charter Bus airport transfers, San Jose hotel transfers, and cruise transfers to and from all local airports, including San Francisco International Airport (SFO), Oakland International Airport (OAK), Sacramento International Airport (SAC) and San Jose International Airport (SJC). Meet-and-greet services and hospitality desks are offered for client convenience - inquire for pricing. We provide vehicles for all San Jose group transportation, including VIPs, conventions, and luggage transfers. We can provide transportation to and from all San Jose Area Convention, visitor, and conference facilities. Visit San Jose 's Convention and Cultural facilities, including McEnery Convention Center, Civic Auditorium, Parkside Hall, Center for the Performing Arts, and Montgomery Theatre. Check out San Francisco 's premier meeting and exhibition facility, The Moscone Center, and the adjoining Yerba Buena Center for the Arts and Yerba Buena Gardens. 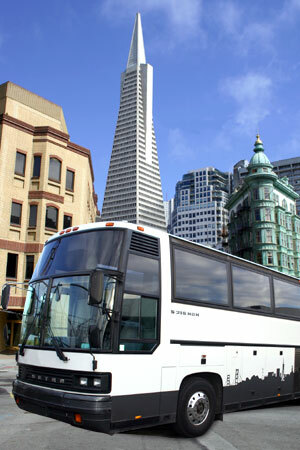 Please be advised that we offer a wide variety of San Jose motor coach and other San Jose buses for charter. 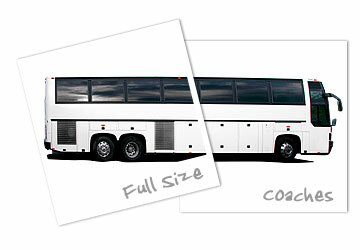 San Jose Charter buses depicted are not necessarily the buses that will be provided for your charter. We offer a wide range of years, makes and models, including, but not limited to, Prevost, MCI, SETRA, Van Hool, Krystal and International vehicles. We may charge a premium to guarantee a specific year (or range of years), make or model of vehicle.